Saffron has amazing antimicrobial or antibacterial qualities, which impart medicinal values in it. Moreover, it also holds excellent exfoliating capacity. Both of these are necessary for clearing up the skin and curing acne. Both saffron and basil are natural anti-bacterial agents, which curbs bacterial growth and shrinks the zits to a great extent. Take 2 tablespoons of pure rose water. Add 12-15 saffron strands to it. Let them soak in rose water for an hour or so. Now, take a handful of fresh basil leaves and make a thick paste of them by grinding with a little rose water. Add the soaked saffron to this paste along with rose water. Apply the mixture to either the trouble spots or all over the face. Wait for 30 minutes so that it turns semi-dry. Just like basil, fresh neem leaves also have very high anti-microbial properties. So, you can mix it up with saffron too. Take a handful of fresh neem leaves and turn them into a thick smooth paste by mixing with some pure rose water. Crush 10-12 saffron strands and add to the neem paste. Pour 2-3 tablespoons of rose water (as required) to it and combine well to prepare a semi-tight mixture. Apply it to your face uniformly. Let it sit for the next 15-20 minutes. Wash off with plain old water. You must keep applying these packs until the breakouts go away completely. 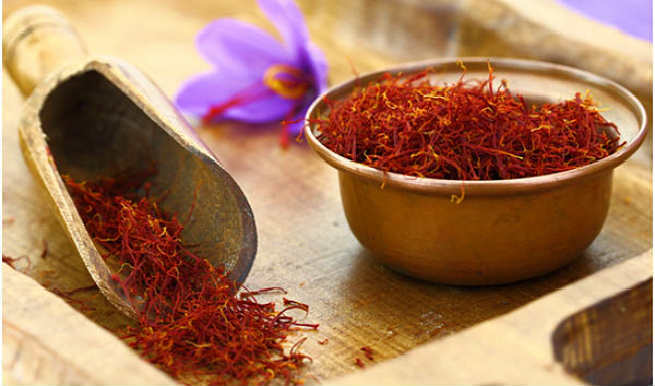 There is no other natural ingredient that can reduce pigmentation and other skin blemishes as effectively as saffron. It is the exfoliating property of the spice, which sloughs off the layer of the dead cells (along with dirt and grime) and reveals a pigmentation-free clear skin. Being a natural antiseptic as well as a great skin lightening agent, turmeric can work together with saffron and diminish pigmentation marks efficiently. Soak 8-10 strands of saffron in a tablespoon of water (you may take rose water in place of plain water). Add 1 tablespoon of turmeric powder to it. Blend well to make a smooth paste of medium consistency. Apply all over the face as a mask. Honey has long been known for its amazing skin benefits. 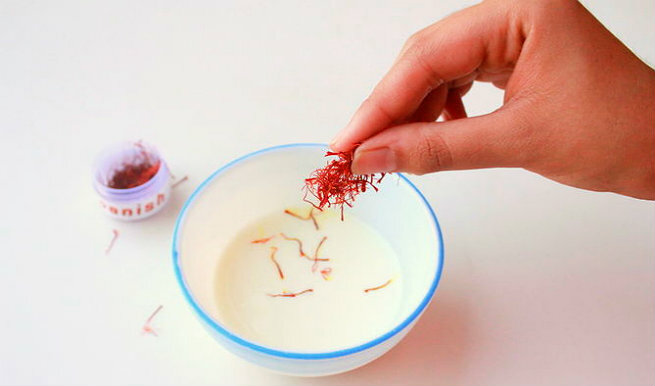 So, when mixed with saffron and milk, it can amplify the results and give a clean, spotless skin easily. Take 1 tablespoon of raw milk. Add 10-12 saffron strands to it. Let them soak in the milk for 45 to 60 minutes. Pour 1 tablespoons of pure organic honey to the milk and blend well. Dab the mixture onto the pigmented areas of your skin evenly. Rinse off with water after half an hour. Double up the exfoliating quality of saffron with some granulated sugar and make your skin free of all marks and impurities. Take a tablespoon of pure olive oil (can be replaced with coconut oil too). Add 8-10 strands of saffron to it. Also, add 2 tablespoons of granulated sugar. Combine all ingredients to form a coarse mixture. Scrub off your skin gently with it, focusing on the trouble areas. Make sure that you use these masks and scrubs twice to thrice every week to remove pigmentation. When it comes to lightening the skin tone naturally, saffron is considered as the best element of all time. It can eliminate dullness and make your skin glowing in a healthy way. Dip 5-6 saffron strands into 2 tablespoons of raw milk. After an hour, add 1 tablespoon of sandalwood powder to it. Make a thick smooth paste and apply as a face mask. Soak 2-3 strands of saffron in a teaspoon of raw milk. In the morning, add 4-5 drops of coconut oil, a teaspoon of rose water and a pinch of sugar to it. Mix well and apply to your facial skin with a brush. Put 1 tablespoon of sunflower seeds in it. Next morning, grind the whole mixture into a thick paste. After 20 minutes, rinse off with water. 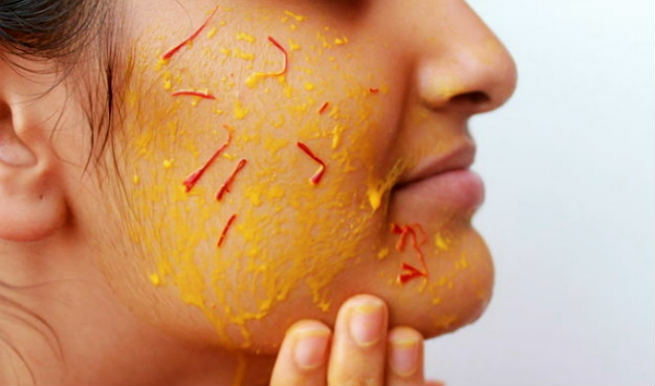 Try these homemade saffron face packs or masks today and get a problem-free skin forever.